the community's appeal lies in its small town friendliness . 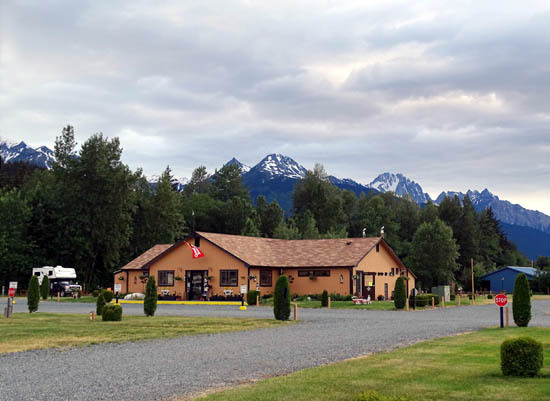 . ."
The scenery and outdoor recreation opportunities in and near Haines were the reasons we chose to spend some time in this gorgeous area. 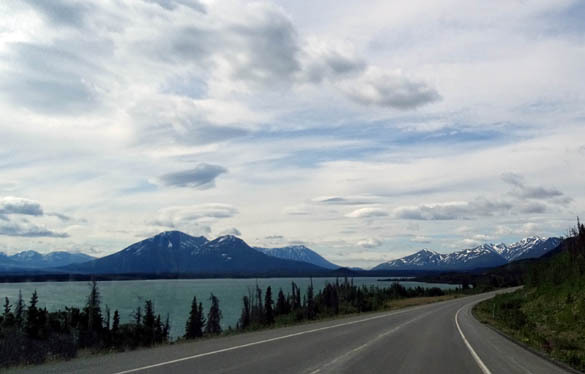 Months ago Jim signed up for the 148-mile Kluane to Chilkat International Bike Relay (KCIBR), intending to ride it solo on June 20. It sounded like a good idea at the time. 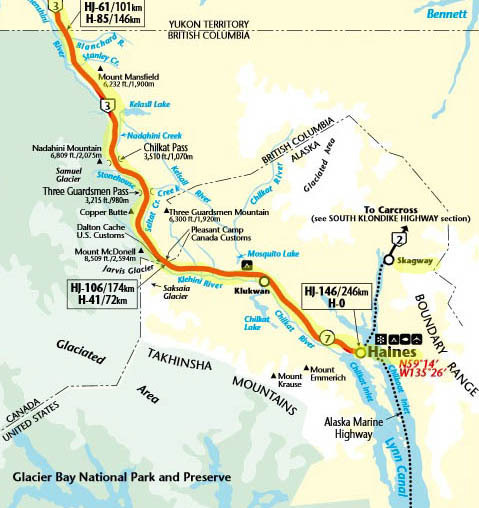 <grin> We planned to spend two weeks in Haines, the finish of the point-to-point race, so Jim could train on the course, which follows the paved Haines Highway south from Haines Junction through parts of the Yukon, British Columbia, and Alaska. 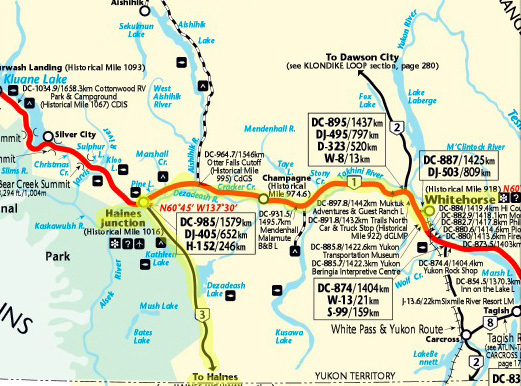 We had a much shorter but more expensive and complicated way to get to Haines from Whitehorse than taking the Alaska Hwy. 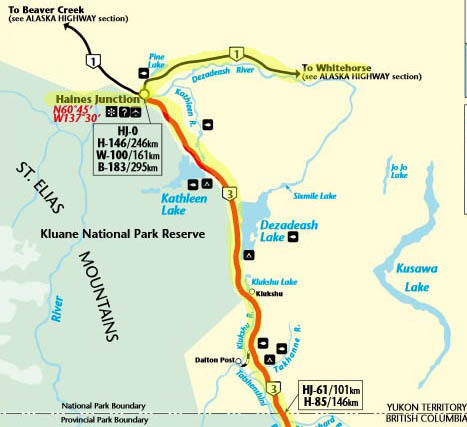 west to Haines Junction and the Haines Hwy. south to Haines. If we'd hauled the Cameo down to Skagway we could have boarded the ferry and ridden it to Haines. That's a hassle with a large RV, however, and Jim wanted to see the relay course southbound, the direction he'd be riding it. 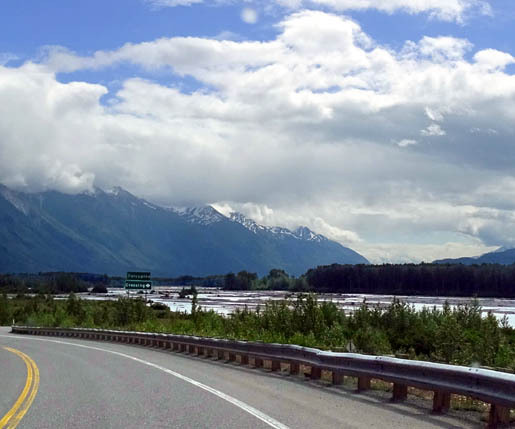 We're both glad we chose to take the land route to Haines on Tuesday because the drive is equally as spectacular as the one to Skagway from Whitehorse. The higher elevations in BC were cold and windy; fortunately, we didn't get into any rain or snow. Driving the race route also gave Jim a new appreciation of the difficulty of the bike relay. Within a few days he decided not to ride it because of the long ascents that would significantly slow him down on his mountain bike. This is truly an event that calls for a lightweight, skinny-tire road bike to make the time cut-offs -- and he doesn't have one of those. He still had fun doing long rides in the Haines area as training for another race in July. 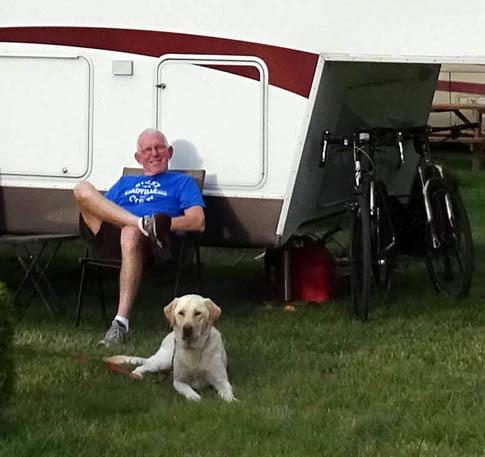 After Jim made the decision to opt out of the Kluane-Chilkat bike relay we stayed in Haines just one week instead of two. That gave us enough time to do everything we wanted to do in the area. This basic route has been used for centuries by Native Americans to reach the interior of Canada from the coast. 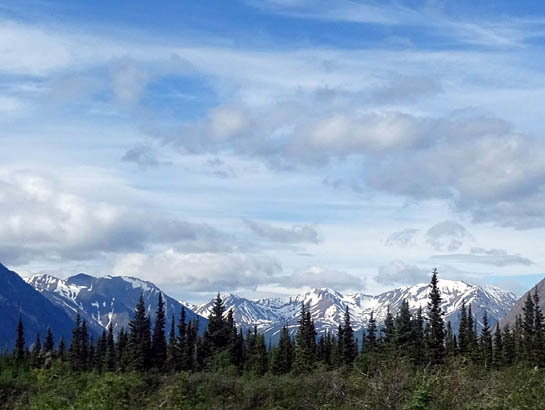 In the late 1800s, just before the Klondike Gold Rush, Jack Dalton pioneered a route over the Three Guardsmen and Chilkat passes to facilitate access to the gold fields in the Yukon. The Haines Hwy. 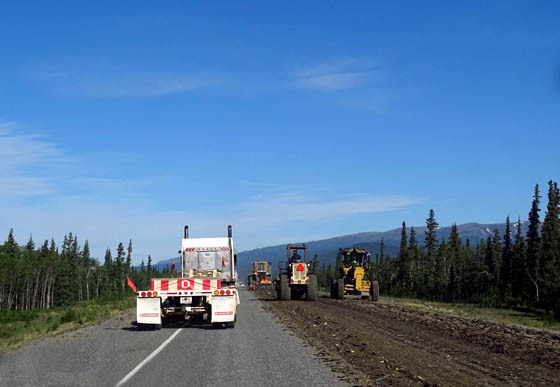 we know today was originally built in 1943 as a military road to connect to the newly built Alaska Hwy. It was paved sometime after the war. 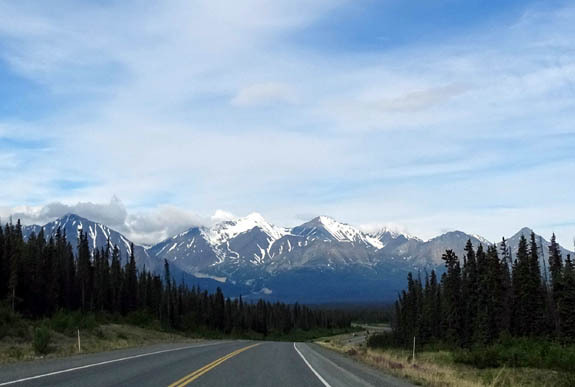 It took us about six hours to drive with the camper on this scenic mountainous route, including two stops at rest areas, a three-minute wait at a one-way work area west of Whitehorse, and U.S. customs at Dawson Cache, Alaska. Traffic was very light the whole way, especially southbound on the Haines Hwy. We saw lots of RVs headed north on the Haines Hwy. About eight were rental truck campers with "Let's Go!" front tags (Adventurer models). The terrain was simply stunning. 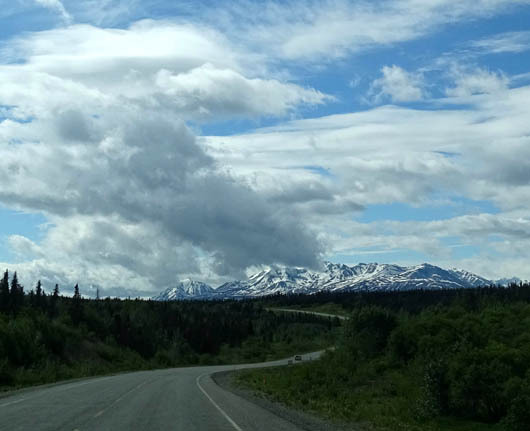 The St. Elias and Takhinsha Mountains were on our right (west) the whole way south on the Haines Hwy., with many glacier views. 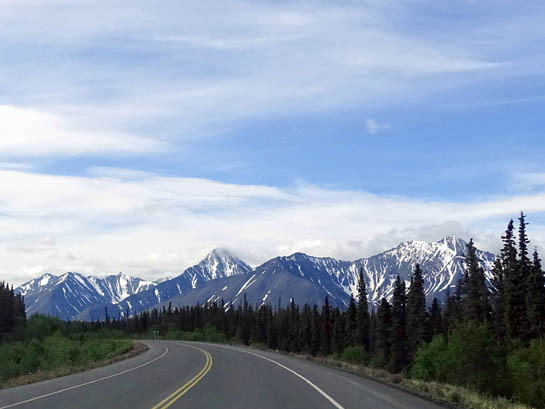 The road borders on Kluane National Park & Preserve in the Yukon, Tatshenshini-Alsek Wilderness Provincial Park in BC, and the Chilkat Bald Eagle Preserve in Alaska. We passed several pretty lakes and crossed numerous streams. 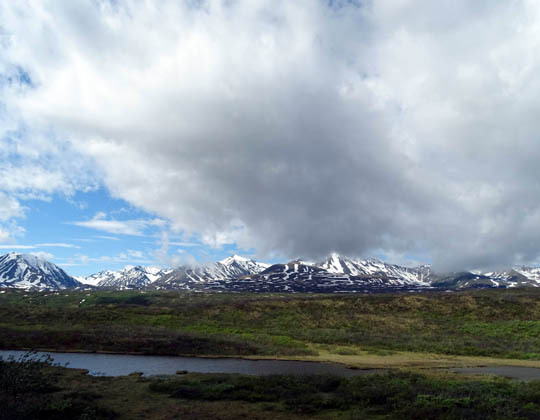 Foothills of the St. Elias Mountains near Haines Jct. as far as 18.008-foot Mt. 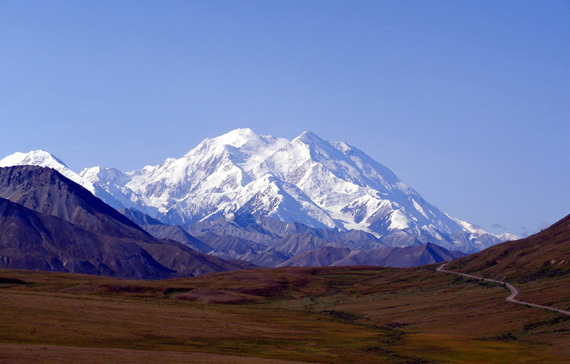 St. Elias, Canada's highest peak. Dezadeash Lake in the Yukon is several miles long. These mountains are higher than previous ones we've passed and have more snow on them. The highway is so exceptionally beautiful that it has been designated a National Scenic Byway. 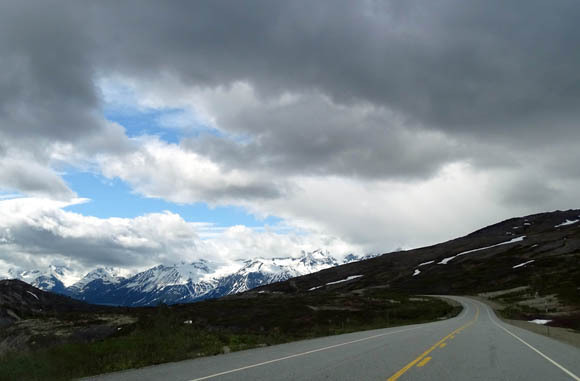 The miles through the high passes in BC are the most spectacular. The alpine area is different -- more green -- than the rocky tundra going to Skagway yesterday. 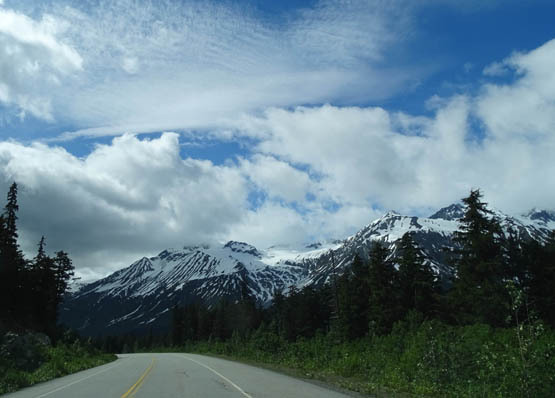 The highest elevation is 3,510 feet at Chilkat Pass in BC. The road takes its biggest dive from there to sea level in just a few miles. 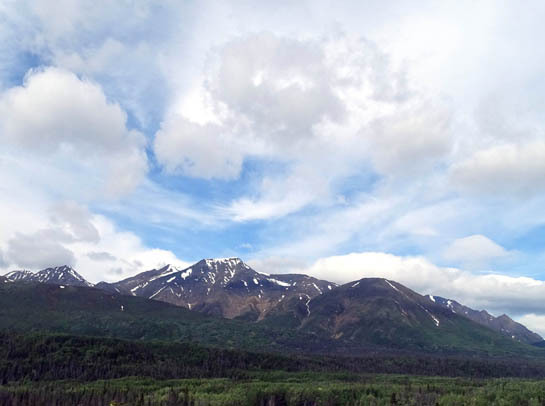 The elevation at the Alaska border is just 700 or 800 feet. Haines is at sea level. 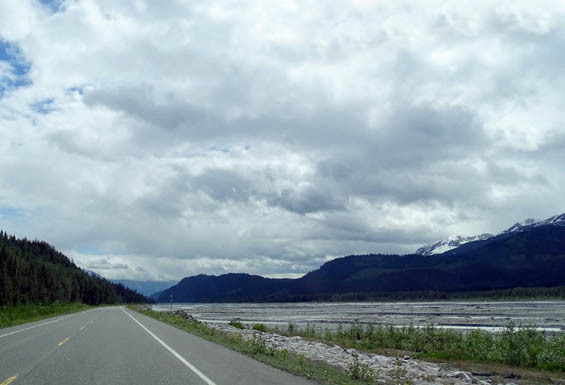 The road follows wide river beds much of the way from the border to Haines and passes through a bald eagle preserve. We saw a group of people getting ready to raft or kayak down the Chilkat River. Later in the week I took a guided raft tour down the river; I'll have a separate entry for that. Despite all the glaciers we passed the water in the Chilkat is cement-colored, not turquoise or blue. All five kinds of Pacific salmon come up the river to spawn. One kind comes up in May and June, so the eagles and bears are out now. After all the driving yesterday and today it's ironic that we are now only 15 water miles from Skagway! We're glad we did both drives, however. We wouldn't have wanted to miss any of the scenery on either road. Jim had his GPS going from Haines Jct. to Haines, noting all the loooong uphill sections, pointing out aid stations, etc. If he had ridden the race I would have been driving the route while he was cycling. Jim also had concerns about the weather on race day. Rain, sleet, snow, and wind could be a problem at the higher elevations. 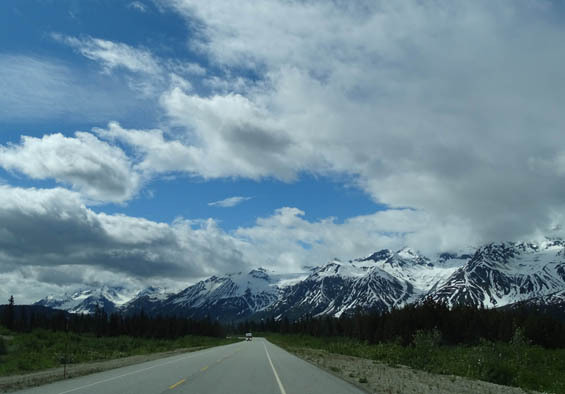 The route is very exposed much of the way, as well as remote -- think grizzly bears and moose. 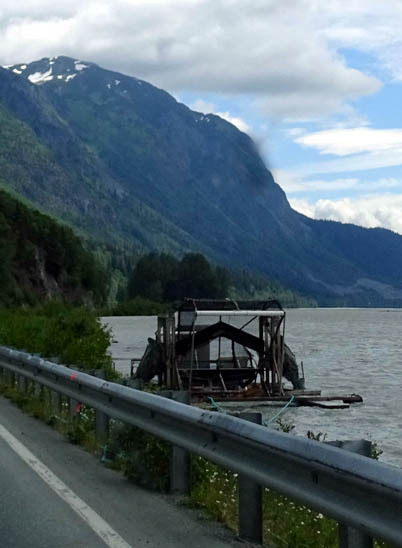 On our drive we saw one dark brown black bear yearling at the northern end of the Haines Hwy. but I didn't get a picture of it. We saw five loose horses along the Alaska Hwy. 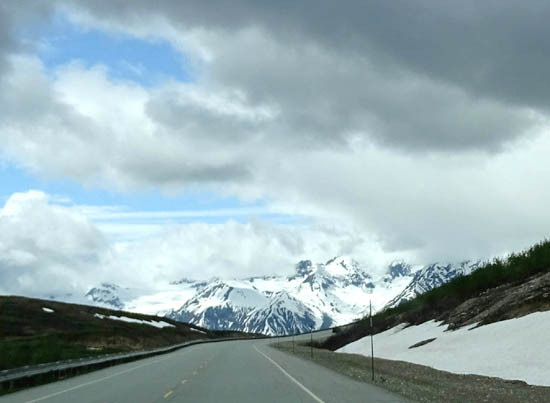 between Whitehorse and Haines Jct. There were elk warning signs but we didn't see any elk. 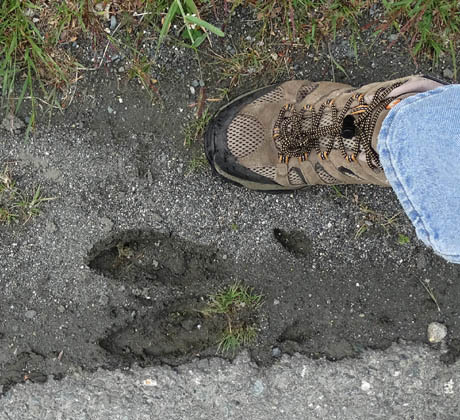 Moose and bears are commonly sighted in Haines, including near the campground, so I was very careful walking the dogs. eight feet apart, indicating it is One Big Moose! 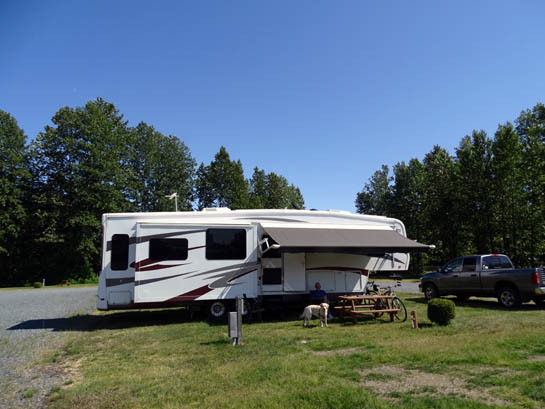 On our first day here I took Cody out to the dog walk along the back of the RV park and a police officer stopped. He commented, "I see you brought some protection!" I asked, "Against what??" He replied that someone had just reported seeing a grizzly bear in the vicinity. Hmmm . . .
Never did see a bear in Haines but there was at least one moose that liked to visit our road. 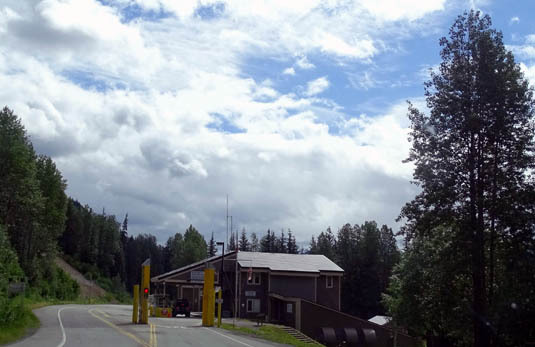 The BC-AK border is several miles south of the Chilkat and Three Guardsmen passes. Like yesterday on our way to Skagway, crossing into Alaska was no problem. That's good, because this time we had the camper with us. We waited about a minute to pull up to the gate. Because of the 12-foot roof Jim went on the other side so the agent was on the passenger (my) side. He was an affable young man. We felt comfortable commenting on the beautiful scenery and Jim's race, which the agent is not looking forward to -- a couple thousand people come through the crossing during the event! The agent looked at our passports, petted the dogs but didn't look at their papers, asked about our itinerary, if we purchased any goods in Canada, if we had any alcohol, tobacco, or firearms, and cheerfully waved us on our way. 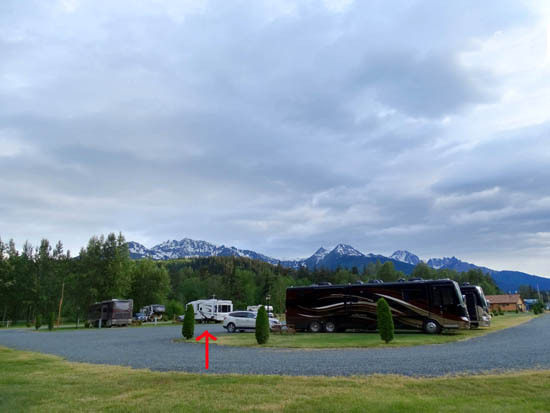 We really enjoyed staying in this campground for a week. It's a pretty place with the largest spaces that we've seen so far on this trip. We highly recommend it. The sites at Haines Hitch-Up are grass, the driveways gravel. The dogs love playing and lying in the soft grass. We are in a pull-thru site with 30-amp electricity, water, sewer, cable (lots of channels, including the History Channel and HGTV), and WiFi. The campground internet is strong (better than our private MiFi) and we have good Verizon phone signals. There are 92 sites. About 20 are pull-thrus, some with 50-amp service. During our stay the park was only about half full at most, and no one was ever right next to us. We paid the more cost-effective weekly rate at $303.08 with tax = $43.30/day. The regular daily rate for sites like ours is higher but includes a Good Sam discount. When it's clear we have nice views of mountains all around us. Looking south we can see a large glacier. The glacier is in the far distance, easier to see with the naked eye than in this photo. 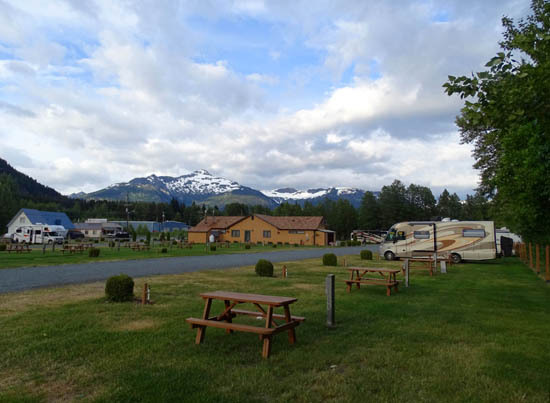 Another view of our side of the campground, looking east -- mountains in every direction! 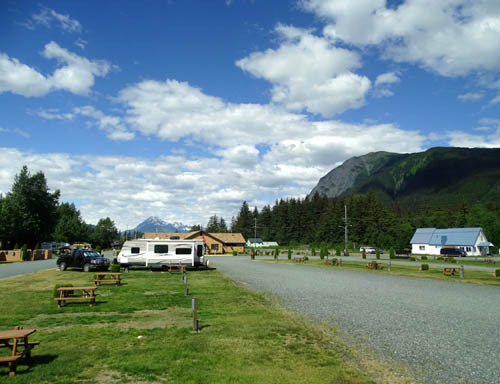 There are two other private campgrounds in Haines but we didn't like either one of them after seeing them. The one by the harbor is crowded, all gravel, and very windy by the water. The one near Fort Seward appears pretty run down. 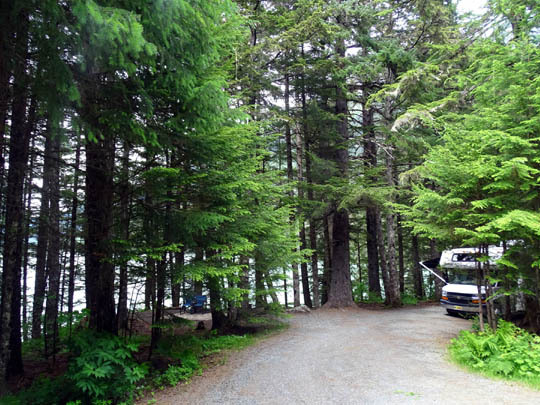 The attractive public campgrounds at Chilkoot Lake State Recreation Site and Chilkat State Park are out of town a few miles, one to the north and one to the south. We drove and/or rode our bikes through both of them. They look like very nice places to camp if you don't want full hookups. 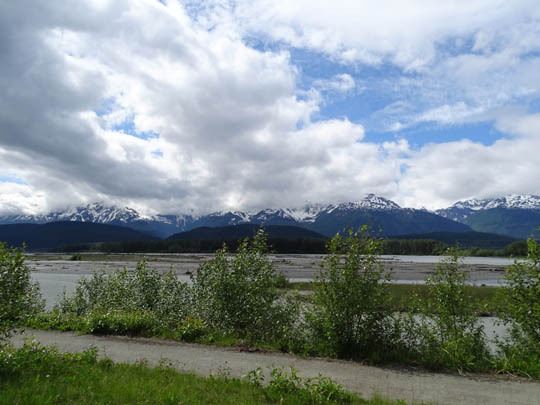 We stayed in Haines just one week, which gave us time to do everything we wanted to do in the area. 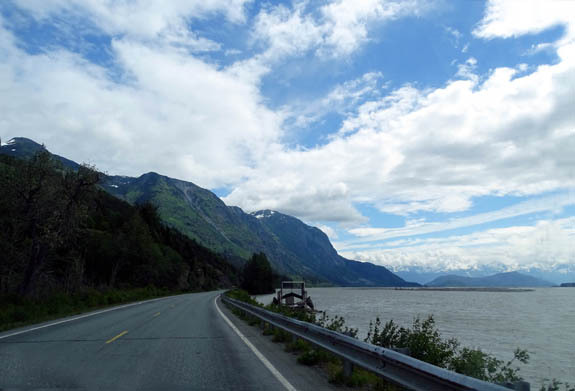 The next entries describe our activities in this beautiful part of southeastern Alaska. Next entry: scenes in and around Haines -- harbor, totems, murals, Fort Seward, Mud Bay Road, fish packing company, Chilkat State Park, etc.